Hip and knee conditions are quite common, especially as you grow older. Whether due to simple wear and tear, falls, arthritis, or sports injuries, severe pain can disrupt your daily activities. If you find yourself missing out on all that life has to offer, the experienced Birmingham, Alabama hip and knee pain specialists at Powell Orthopedics & Sports Medicine are here to help. Our compassionate providers can diagnose your pain and provide both surgical and nonsurgical treatment options to get you back to good health. 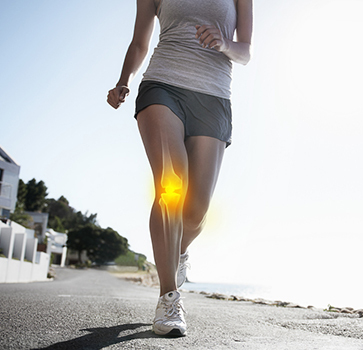 We specialize in treating many types of hip and knee conditions. After our board-certified orthopedic surgeon, Dr. Thomas E. Powell, diagnoses your issue, he will discuss treatment options with you and help you decide which would be best for you and your lifestyle. If you require joint replacement surgery and reconstruction, we use the latest minimally invasive techniques to reduce pain and recovery time. Depending on your particular needs, we may also utilize a full range of other treatment options. Below you’ll find the most common hip and knee conditions we evaluate and examples of the treatments we offer. If you’re experiencing hip or knee pain in Birmingham, Alabama, Powell Orthopedics & Sports Medicine is here to help. Call (205) 877-9191 to make an appointment today or request an appointment online at your convenience.